A shifting map full of flying horses, hungry demons, mystical landscapes, and the New Jersey turnpike? This could only be a project for To Be Continued, our chapter book story time for ages 6-8! We read The Serpent’s Secret: Kiranmala and the Kingdom Beyond by Sayantani Dasgupta, with illustrations by Vivienne To (Scholastic, 2018). Kiranmala is a regular girl, living in New Jersey with her loving, if not slightly eccentric, parents. For example, they insist that every Halloween (which also happens to be her birthday), she dress as an Indian princess, complete with bangles, necklaces, and a silk sari. In fact, they insist she is a REAL Indian princess. Oh, and they also want her to sleep with the curtains open during a full moon, and dig a snake moat around the house. Everything changes the day Kiran turns 12. Her parents disappear, a rakkhosh demon demolishes her house, and 2 princes on flying horses (one armed with a sword, the other with sarcasm) inform her that she is, indeed, a princess from another dimension. Now Kiran must rescue her parents, save her friends, and discover who she really is in the process. In the book, Kiran and her “friend” Prince Neel (it’s complicated) use a moving map to locate Kiran’s parents. As the name suggests, the land masses in Kiran’s dimension don’t stay in one place, they shift – requiring a map that can shift as well. Hmmmm…a continuously shifting landscape? Sounds like a job for myriorama cards! Myriorama cards, which debuted in 19th century Europe, are these cool little decks of cards with matching skies and horizon lines (I review of a modern deck of myriorama cards in this post). No matter what order you put the cards in, they always sync to create a continuous landscape or story. See how I flipped the above cards around a little to make a new map below? It’s easiest to use 3″ x 5″ blank index cards. 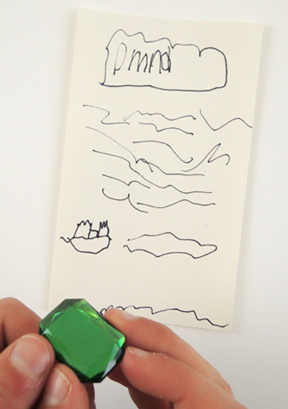 On the first card, use a pen to mark where you want your horizon and land lines to go. Next, mark the other cards in the deck, making sure they all match. 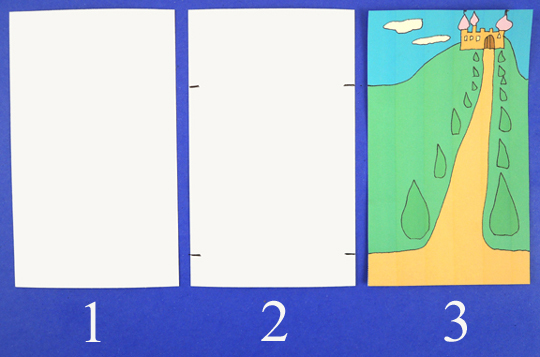 Now draw a landscape or scene on each card, always matching the horizon and land lines. 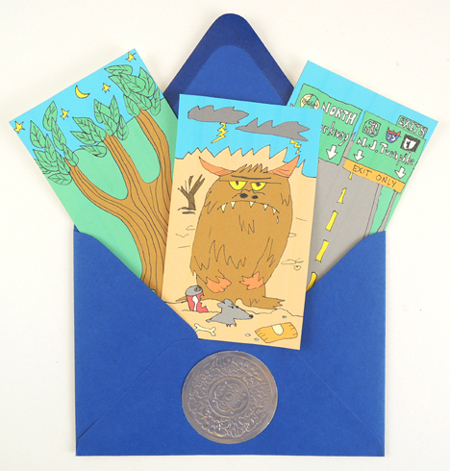 For our story time activity, I gave each kid a colorful envelope bedecked with a silver embossed foil seal (a subtle nod to a moon maiden in the book). Inside the envelope were 6 finished myriorama cards to get the kids started (including characters and scenes from the book, of course!). The cards were black and white so the kids could color them in. There were 3 blank cards in the envelope, as well as a stack of more blank cards, so they could let their imaginations run free. If you’d like the myriorama cards I drew, you’ll find the black and white template here, and the color template here. However! I will say the cards are not perfect. The horizon and land lines matched up when I drew them, but somehow between scanning them, setting them, and turning them into a pdf they don’t quite match up on the final templates. Did the kids care? They did not. Also! I’m not a trained artist…even though I have to say, I liked how my rakkosh turned out. This entry was posted in Chapter Book Projects and tagged activity, art, card, cards, children, craft, craft project, easy, endless landscape, how to, instructions, kids, library, literacy, map, myriorama, program, programs, Sayantani Dasgupta, story time, story time project, storytime, The Serpent's Secret, To Be Continued, Vivienne To by Dana Sheridan. Bookmark the permalink.